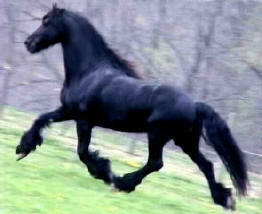 This is our Friesian stallion FLYING W FARMS BARON VON KOLDERVEEN. 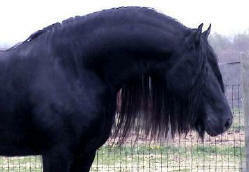 FPS#199717391 (17 hands) Baron's sire is REYERT by the famous Reitse (Stb.Preferent) out of the beautiful mare CORRIE. 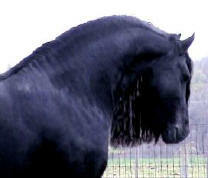 Baron is a very Classical, Baroque type Friesian with extremely long and full mane and tail. Baron was foaled in 1997; we imported him from Holland in 2001; His first foals were born in 2002 and they are so beautiful!!! He puts those tiny hooked ears on all of them, as well as his long beautiful neck and amazing movement! 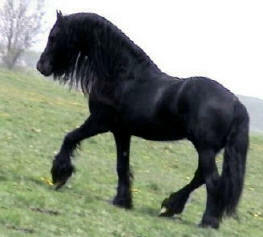 He also imparts to his foals what surely is one of the sweetest and very most loving of all dispositions!!! Baron is such a sweetheart! Those who have visited here and met him are amazed at how much of a people lover he really is. 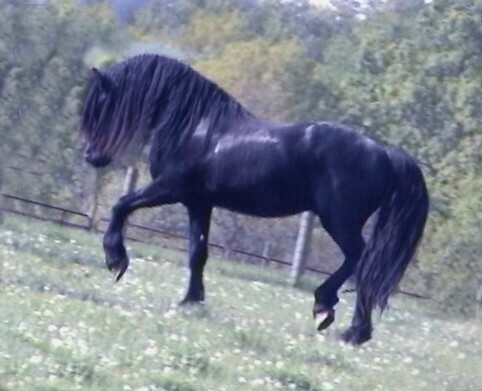 He will leave his mares and follow small children around the field; We have photos of him standing with his beautiful head lowered to the ground so a child can hug him and braid his long, luxurious mane. All of his foals seem to inherit this wonderful temperament from Baron. He also is a incredible mover, ideal for dressage/CT. 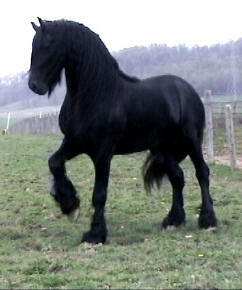 He has very deep hocks, way up under the middle of himself when he moves, super impulsion, suspension and extension . 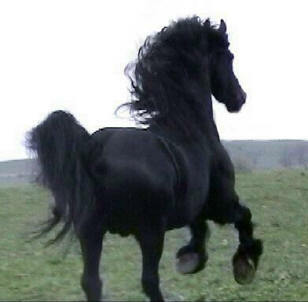 He passes this movement on to his foals!! Baron has a lovely head and big, kind soft eyes, tiny hooked ears and an abundance of flowing mane and tail. 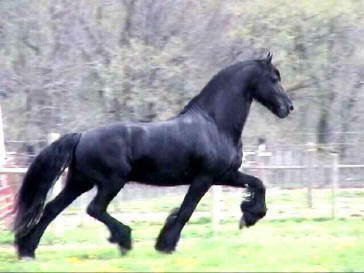 He is the classical old style Friesian,( what we call Baroque). 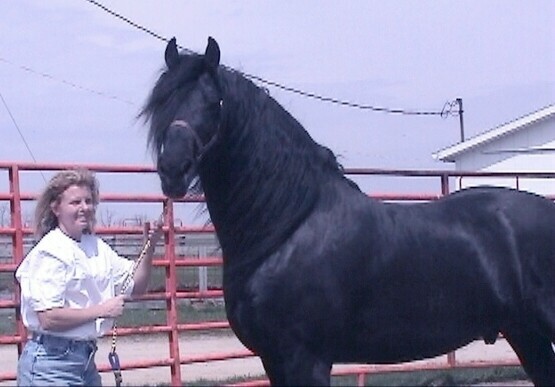 Baron is a perfectly wonderful cross and compliment to our Saddlebred and other light horse mares. His babies are more than we ever dreamed they would be!! They are so beautiful!